AuthorCentrix celebrates its second year as one of the exhibitors at the Fair. The company will be gracing the event with Thea Torgensen. This year at the Fair, she brings to the readers, a Suspense Thriller that will take the readers to the depths of their imagination. While Friday The 13th is said to be a Doom day, wait until she reveals the secrets of The Dead Man’s Mind. A chance for one-to-one Author Interview and Book Signing with Torgensen await everyone! It’s Friday The 13th and the overly superstitious fishermen face the scariest monsters – the ones that lurk within their souls. The sky scattered with dark clouds and a misty fog hung over the ocean. Captain John Carl Thomason watched his crew unload the catch on the dock. He snaps as Remi, a short balding man mutters how things have changed around. He continues to mock him as he eats banana which everyone believes to be a bad luck on that very day. Captain Thomason and Remi’s commotion continues until their hunch about Friday the 13th turns into a reality. How bad could the day get for them both and the rest of the crew? 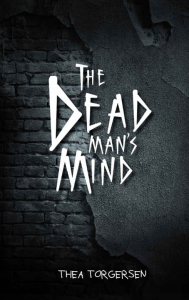 What is inside the dead man’s mind?